More than 1500 Sydneysiders, decked head-to-toe in white converged on the forecourt of the Museum of Contemporary Art for Sydney's inaugural Diner en Blanc, a mysterious, impromptu and spectacular evening picnic. More than 1500 Sydneysiders, decked head-to-toe in their best white converged on the forecourt of the Museum of Contemporary Art for Sydney’s inaugural Dîner en Blanc, a mysterious, impromptu and quite spectacular evening picnic. 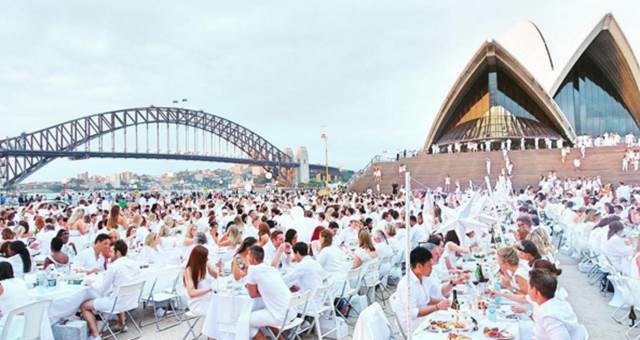 Over 1500 guests dined on Sydney’s MCA forecourt as part of the inaugural Diner en Blanc. From 6pm on Saturday (27 October) evening, Australia’s global city put on fine weather, great tunes, delicious food, marvellous wines, plenty of white and some festive dancing in the shadows of the iconic Harbour Bridge and Sydney Opera House. And as soon as it started, it seemed it had gone – with the whole affair packed up and moved on before midnight. The event took place with help from Katrina Regan while sound and lighting partners for the event were Bump Productions. Guests enjoyed fine food, wine and entertainment on the MCA forecourt. Dîner en Blanc was launched by a group of friends more than 20 years ago in Paris and now brings together more than 15,000 people each year, to some of the world’s biggest cities such as New York, Vancouver, Barcelona, Mexico City, Singapore and many more. This wonderful event was supported by the NSW Government through Destination NSW and Santa Vittoria, and was part of the Crave Sydney International Food Festival. Other proud partners included Pol Roger champagne, Terre a Terre and Spinifex wines. An unexpected performance took place in the Opera House forecourt last Saturday night. 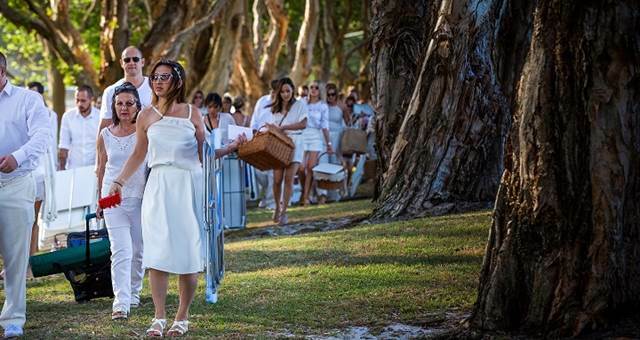 The third annual Sydney Diner en Blanc was held in Centennial Park on Saturday night. 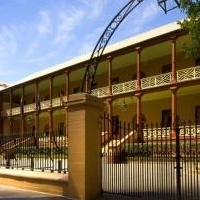 Explore the brand new event spaces available at NSW Parliament House in Sydney.